The Taphrinomycotina include a disparate and basal group within the Ascomycota that was recognized following molecular (DNA) analyses. The taxon was originally named Archiascomycetes (or Archaeascomycetes). 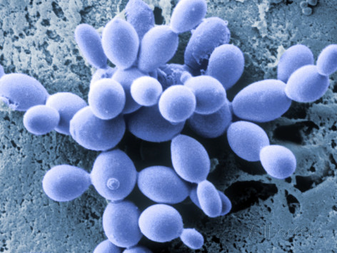 It includes hyphal fungi (Neolecta, Taphrina, Archaeorhizomyces), fission yeasts (Schizosaccharomyces), and the mammalian lung parasite Pneumocystis. A member of the Cordyceps genus which is parasitic on arthropods. Note the elongated stromata. Species unknown, perhaps Cordyceps ignota. Most species grow as filamentous, microscopic structures called hyphae or as budding single cells (yeasts). 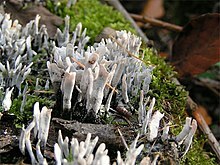 Many interconnected hyphae form a thallus usually referred to as the mycelium, which—when visible to the naked eye (macroscopic)—is commonly called mold. 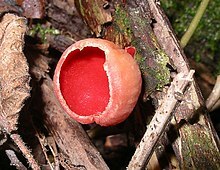 During sexual reproduction, many Ascomycota typically produce large numbers of asci. The ascus is often contained in a multicellular, occasionally readily visible fruiting structure, the ascocarp (also called an ascoma). Ascocarps come in a very large variety of shapes: cup-shaped, club-shaped, potato-like, spongy, seed-like, oozing and pimple-like, coral-like, nit-like, golf-ball-shaped, perforated tennis ball-like, cushion-shaped, plated and feathered in miniature (Laboulbeniales), microscopic classic Greek shield-shaped, stalked or sessile. They can appear solitary or clustered. Their texture can likewise be very variable, including fleshy, like charcoal (carbonaceous), leathery, rubbery, gelatinous, slimy, powdery, or cob-web-like. Ascocarps come in multiple colors such as red, orange, yellow, brown, black, or, more rarely, green or blue. 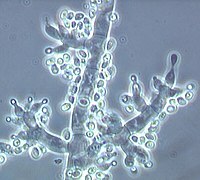 Some ascomyceous fungi, such as Saccharomyces cerevisiae, grow as single-celled yeasts, which—during sexual reproduction—develop into an ascus, and do not form fruiting bodies. Apart from a few exceptions, such as Candida albicans, most ascomycetes are haploid, i.e., they contain one set of chromosomes per nucleus. During sexual reproduction there is a diploid phase, which commonly is very short, and meiosis restores the haploid state. The sexual cycle of one well-studied representative species of Ascomycota is described in greater detail in Neurospora crassa. Also, the adaptive basis for the maintenance of sexual reproduction in the Ascomycota fungi was reviewed by Wallen and Perlin. They concluded that the most plausible reason for the maintenance of this capability is the benefit of repairing DNA damage by using recombination that occurs during meiosis. DNA damage can be caused by a variety of stresses such as nutrient limitation. 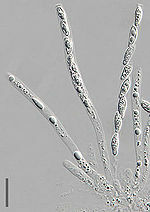 Gametangia are sexual structures formed from hyphae, and are the generative cells. A very fine hypha, called trichogyne emerges from one gametangium, the ascogonium, and merges with a gametangium (the antheridium) of the other fungal isolate. The nuclei in the antheridium then migrate into the ascogonium, and plasmogamy—the mixing of the cytoplasm—occurs. Unlike in animals and plants, plasmogamy is not immediately followed by the merging of the nuclei (called karyogamy). Instead, the nuclei from the two hyphae form pairs, initiating the dikaryophase of the sexual cycle, during which time the pairs of nuclei synchronously divide. Fusion of the paired nuclei leads to mixing of the genetic material and recombination and is followed by meiosis. A similar sexual cycle is present in the blue green algae (Rhodophyta). A discarded hypothesis held that a second karyogamy event occurred in the ascogonium prior to ascogeny, resulting in a tetraploid nucleus which divided into four diploid nuclei by meiosis and then into eight haploid nuclei by a supposed process called brachymeiosis, but this hypothesis was disproven in the 1950s. Naked asci: these are simple ascomycetes and asci are produced on the plants surface. 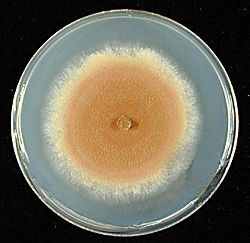 Perithecia: Asci are in flask-shaped ascoma (perithecium) with a pore (ostiole) at the top. Cleistothecia: The ascocarp (a cleistothecium) is spherical and closed. Apothecia: The asci are in a bowl shaped ascoma (apothecium). These are sometimes called the "cup fungi". Pseudothecia: Asci with two layers, produced in pseudothecia that look like perithecia. The ascospores are arranged irregularly. Members of the Ascomycota such as Stachybotrys chartarum are responsible for fading of woolen textiles, which is a common problem especially in the tropics. Cereals infected with Fusarium graminearum contain mycotoxins like deoxynivalenol (DON), which causes Fusarium ear blight and skin and mucous membrane lesions when eaten by pigs. 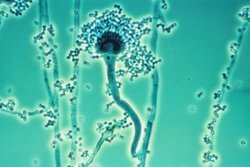 Aspergillus fumigatus, the most common cause of fungal infection in the lungs of immune compromised patients often resulting in death. Also the most frequent cause of Allergic bronchopulmonary aspergillosis, which often occurs in patients with Cystic fibrosis as well as Asthma. Ergot (Claviceps purpurea) is a direct menace to humans when it attacks wheat or rye and produces highly poisonous and carcinogenicalkaloids, causing ergotism if consumed. Symptoms include hallucinations, stomach cramps, and a burning sensation in the limbs ("Saint Anthony's Fire"). In Asia, Aspergillus oryzae is added to a pulp of soaked soya beans to make soy sauce, and is used to break down starch in rice and other grains into simple sugars for fermentation into East Asian alcoholic beverages such as huangjiu and sake. ^ Cavalier-Smith, T. (1998). "A revised six-kingdom system of Life". Biological Reviews of the Cambridge Philosophical Society. 73 (3): 203–266. doi:10.1111/j.1469-185X.1998.tb00030.x. PMID 9809012. ^ Lutzoni F; et al. (2004). "Assembling the fungal tree of life: progress, classification, and evolution of subcellular traits". American Journal of Botany. 91 (10): 1446–80. doi:10.3732/ajb.91.10.1446. PMID 21652303. ^ James TY; et al. (2006). "Reconstructing the early evolution of Fungi using a six-gene phylogeny". Nature. 443 (7113): 818–22. Bibcode:2006Natur.443..818J. doi:10.1038/nature05110. PMID 17051209. ^ "Caterpillar Fungus". Archived from the original on 2007-03-12. ^ Krajicek BJ, Thomas CF Jr, Limper AH (2009). "Pneumocystis pneumonia: current concepts in pathogenesis, diagnosis, and treatment". Clinics in Chest Medicine. 30 (2): 265–89. doi:10.1016/j.ccm.2009.02.005. PMID 19375633. ^ James RR, Skinner JS (2005). "PCR diagnostic methods for Ascosphaera infections in bees". Journal of Invertebrate Pathology. 90 (2): 98–103. doi:10.1016/j.jip.2005.08.004. PMID 16214164. ^ Laybourn-Parry J., J (2009). "Microbiology. No place too cold". Science. 324 (5934): 1521–22. Bibcode:2009Sci...324.1521L. doi:10.1126/science.1173645. PMID 19541982. ^ Mello A, Murat, Bonfante P (2006). "Truffles: much more than a prized and local fungal delicacy". FEMS Microbiology Letters. 260 (1): 1–8. doi:10.1111/j.1574-6968.2006.00252.x. PMID 16790011. Archived from the original on 2012-12-10. Retrieved 2009-08-31. ^ Carlile, Michael J. (2005). "Two influential mycologists: Helen Gwynne-Vaughan (1879-1967) and Lilian Hawker (1908-1991)". Mycologist. 19 (3): 129–131. doi:10.1017/s0269915x05003058. ^ "Ascomycota - Characteristics, Nutrition and Significance". MicroscopeMaster. Retrieved 2019-03-04. ^ Schulz B, Boyle C., B; Boyle, C (2005). 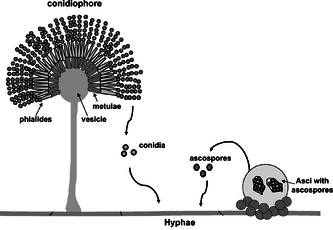 "The endophytic continuum". Mycological Research. 109 (6): 661–86. doi:10.1017/S095375620500273X. PMID 16080390. ^ Moser, J.C.; Konrad, H.; Blomquist, S.R. ; Kirisits, T. (2010). "Do mites phoretic on elm bark beetles contribute to the transmission of Dutch elm disease?". Naturwissenschaften. 97 (2): 219–227. Bibcode:2010NW.....97..219M. doi:10.1007/s00114-009-0630-x. PMID 19967528. Alexopoulos, C.J. ; Mims, C.W. ; Blackwell, M. (1996). Introductory Mycology. Wiley. ISBN 0-471-52229-5. Deacon, J. (2005). Fungal Biology. Blackwell. ISBN 1-4051-3066-0. Jennings DH, Lysek G (1996). Fungal Biology: Understanding the Fungal Lifestyle. Guildford, UK: Bios Scientific. ISBN 978-1-85996-150-6. Kirk PM, Cannon PF, Minter DW, Stalpers JA (2008). Dictionary of the Fungi (10th ed.). Wallingford: CABI. ISBN 0-85199-826-7. Taylor EL, Taylor TN (1993). The Biology and Evolution of Fossil Plants. Prentice Hall. ISBN 0-13-651589-4.